I found very littel information about this poet. If you, gentle reader, have any more information about this poet, please let me know or add it as a comment to this entry.
" Thanks for your translation of Koha's death poem, Gabi. It's a revelation to realise that 'face to face' isn't indicated in the original Japanese. The poem reads quite differently without it. I like it better, in fact, as 'face to face' struck me as a literary conceit that distracted from the simplicity of the renunciation of the brush and the artwork or poetry they represent. The new translation is very illuminating. I feel the poet is alluding to the zen phrase warning us not to confuse fingers pointing at the moon with the moon itself. 'Moon' symbolising consciousness/buddha nature/all-that-is/oneness/god (whichever label the reader prefers). The breaking of the brush may indicate the end of 'pointing'; that is the end of thoughts attempts to illustrate/understand/witness the 'moon'. 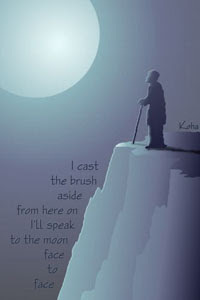 'speaking only to the moon' could suggest realisation/enlightenment as in the quoted Chiyo-ni poem. Or, as this is a death poem, "from now on I speak to nobody and nothing but the moon," may be refering to the poets belief that after death there is only 'moon', that she/he will return/reunite with the 'moon'. The moon being consciousness/buddha nature/all-that-is/oneness/god etc. when a painter or writer gives up his work. I have an impression that the poetess used the word "nageru," instead of "oru," though she must have the latter on her mind; she threw /cast / put away / aside her brush and was not going to use it to write her haiku. I have a different image from the one you posted. The person standing on the tiers and supposedly talking to the moon somehow reminds me of Friedrich Nietzsche. Because of the long coat? This is ominous, isn't it? My image of 香葉 is that she is seated looking at the moon, out of a shoji sliding door in the clay wall. The name of the poet is given as 大場香波. Jisei, a "farewell poem to life"
. 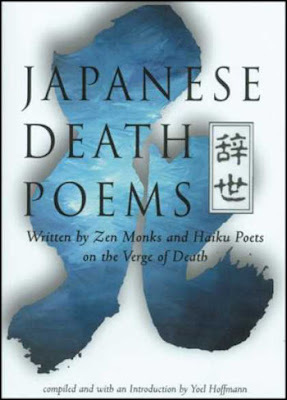 Death Haiku of Matsuo Basho 1694 .
. fuyu uguisu mukashi Ooi ga kakine kana . These three visionary hokku were literally written just before Buson died. He had been suffering from general weakness and severe chest pains since late in the fall of 1783, when he was sixty-three, and in the twelfth month he was too weak to leave his bed. In the middle of the night of 12/24 (Jan. 16, 1784) he called Gekkei, a painter who was studying under him and taking care of his needs, to bring a brush and inkstone, and he dictated the first two hokku. Then he rested for a while, and as the first light of dawn was appearing he dictated the final hokku to Gekkei. Two versions of the third hokku are given because the first version, published by Buson's protege Kitō, differs from the manuscript left by Gekkei, who made the original transcription. My translation follows Gekkei's version (shira-ume no....). The first hokku evokes the great 8th-century Chinese poet and painter Wang Wei, a contemporary of Li Bo and Du Fu who wrote mostly nature poetry influenced by Daoism and Zen. As a painter he was also a major precursor of of later "literati artists" who sought to evoke the spirit of a landscape and valued the rhythms of natural scenes above mere technical verisimilitude. Wang did much of his best work at his country house, where he secluded himself from the world and from the wars ravaging China at the time. He was one of Buson's favorite painters, and in the first hokku Buson seems to feel his soul is traveling between 1784 and the 8th century. He hears a "winter warbler," that is, a warbler which has come down to a low-lying area to forage in the winter. In the cold months warblers make only a short, sharp cheeping call which is very different from the beautiful calls they acquire in spring. Buson is sure that the calls of the warbler outside are coming from the hedge planted around Wang Wei's country house a thousand years earlier, perhaps since in death Wang Wei and Buson are no longer separated by time. In Japanese poetry birds are often represented as souls visiting from the other world, and Buson may feel his soul has already flown as far as Wang Wei's hedge. In the second hokku the bird seems to have come closer to the room in which Issa is lying. The bird may still be making short cries, but Buson also hears, or in his mind's ear he hears small, faint sounds coming from near or inside a frost-covered bush just outside. Are the sounds the pecking of the warbler, or its sharp footsteps scratching frosted leaves or spikes of frost on the ground, or the rustling of leaves on the bush? Buson wants to know what the small bird is doing so frenetically. Some Japanese commentators feel Buson is overlapping the warbler with himself as a kind of double. He seems worried about why the worried bird keeps making so many small sounds. Is it unable to find any food in the frost-covered garden? Will it survive? Buson seems to want to go down into the garden to help the bird with whatever it's doing. He also seems to sense the similarity between his own weak, scattered speech and the sounds made by the warbler. Perhaps this realization leads him to stop worrying and talking too much to Gekkei and to silently calm his mind, to prepare to leave the frost-covered bush of his body, and to accept death. 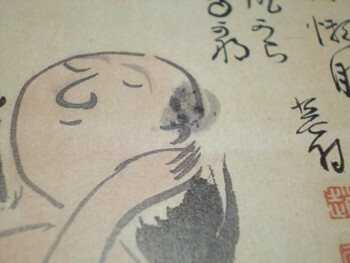 The third hokku suggests Buson has reached an area of peace and has experienced some kind of revelation during his final morning. Time continues to expand and contract, and the time when Buson recites the third hokku is concurrent with another time flow, a situation that causes Buson to ask Gekkei to make a headnote saying the hokku takes place in the future, in early lunar spring several days after lunar 12/25, when he will no longer be in the world. White plums are in blossom this morning, and they were in blossom yesterday morning, and they will be in blossom at dawn for several more weeks because it is now early spring. 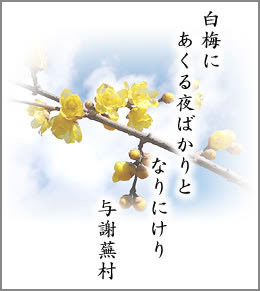 The faint but clear and sweet fragrance of the new plum blossoms wafts everywhere, and by implication the warblers are surely now calling out in their spring voices that sound to humans as if they were singing "Ho-, Hokekyo," or "Lo-, Lotus Sutra." The Lotus Sutra mentions Amida Buddha's Pure Land, and the white plum blossoms suggest great purity, so Buson seems to be seeing a vision of himself in the Pure Land even while he is still alive. He has already been in the Pure Land for a few days, or perhaps forever, since the Pure Land is a land of timeless time. Buson was a believer in Hōnen's Pure Land school, and his protege Kitō writes that Buson was so peaceful when death came that he was surely reborn in the Pure Land. The sun setting in the west is a much more common image of the Pure Land, which is said to lie beyond the western edge of the universe, but Buson did not rely on this traditional image. He chose to evoke transcendent purity at dawn, an image of rebirth that perhaps transforms the cold frost image in the previous hokku and endows it with lambent cosmic dimensions. this haiku was etched on Issa's gravestone. Issa wrote this some time after the 24th day of Eleventh Month, 1812, when he returned to his native village, determined to fulfill his father's dying wish for him to live in the family home. By Second Month of 1813, his inheritance dispute with his stepmother was resolved, and he returned for good. In March 2015 while visiting Issa's home province of Nagano, I and Issa scholar Tsukasa Tamaki viewed the original manuscript in which this haiku appears: a small notebook filled with Issa's haiku in black with corrections in red by his haiku teacher and benefactor Natusme Seibi. To the side of the middle phrase, tsui no sumika ka ("my last residence? "), Issa offered an alternative middle phrase, which Seibi rejected by crossing it out. Professor Tamaki translates Issa's alternative version as "my death place?" We agreed that Seibi was wrong to reject this much stronger statement. I've emended my translation to reflect Issa's rewrite.